My little baby. 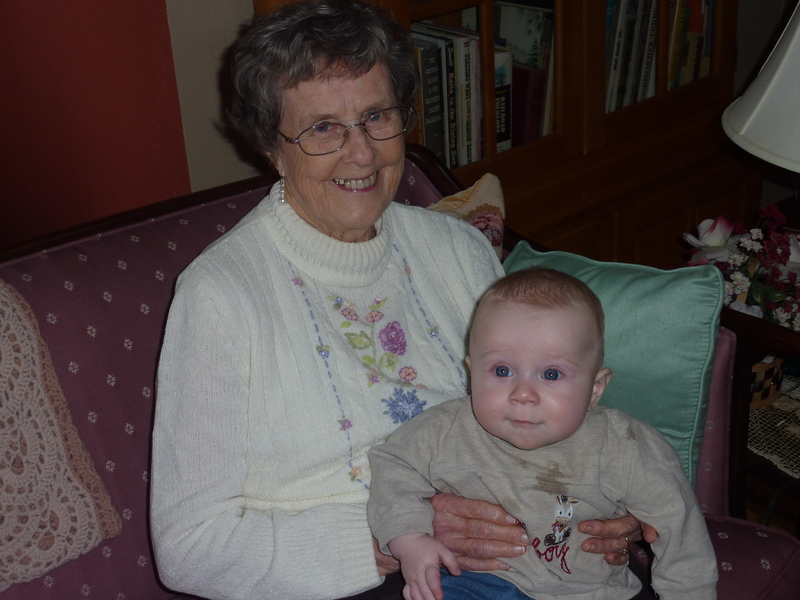 This was Christmas day with his great-grandma. He’s six months old now and is a squealing ball of love and fun. And a time sink. But that’s okay; I love all the time I get to spend with him. It just means that I have to learn to become a little less selfish and have a little less “me time.” (“Me time” used to be spent in the kitchen, but now it’s sitting down when he’s taking a nap!) I have my mom’s group tonight and we’re working on crafts, which will be good because I can get this cross-stitch project finally done, and I am bringing a dessert. With the little time I’ve had today, I decided to make a strawberry sauce to go with ice cream. (I bought a big frozen bag at Costco and it’s taking up too much room in my freezer.) This recipe comes from our family cookbook and is the best strawberry sauce I’ve ever made, and I am not biased. It’s versital enough that it’d go with cakes, biscuits, pancakes, crepes, whatever. (Just pour it on!) Okay, I’m making myself really hungry. You can use fresh or frozen strawberries. Since mine were frozen, I let them sit out for a couple of hours. Take one cup of the strawberries and put them in the food processor or blender. Blend until really fine. Take the other cup and slice into small chunks. In a small saucepan, combine the sugar and cornstarch. Slowly add water. This is me adding water while trying to take a picture. MUCH harder than it looks. Then add the pureed and chopped strawberries. Get it to boil on medium heat and boil one minute. Remove from the heat and add the lemon juice. Let it sit for about 3 minutes and then serve. Place 1 cup strawberries in blender; cover. Blend on high 15 seconds or until smooth. In 2-quart saucepan, stir together cornstarch and sugar on medium heat. Gradually stir in water until smooth. Stir in pureed strawberries and remaining 1 cup sliced strawberries. Stirring constantly, bring to boil over heat and boil 1 minute. Will this recipe work with boysenberries that are tart? Should I add more sugar and less water? I don’t like it so soupy. I believe they would work with any fruit. I would add the same amount of sugar and after it cooks, test it to see if it needs more sugar. Let me know how it works!